Dean E. Hallmark would be 97 today. He died during World War II and this part of his life, his heroic service, and his sacrifice, has been well documented, but he has become one of those names almost lost to the whispers of history. Like all war stories, Dean Hallmark’s is gripping, unique, and worth retelling. It is tragic, frustrating, and ennobling. But the end of his story is where it actually starts. It was the 1944 classic film of the famous Doolittle Raid, Thirty Seconds Over Tokyo, that caught Maj. Adam Hallmark’s interest. Adam is a modern-day military man. He serves in the Army. He’s a history graduate of the University of North Alabama. He’s an Auburn man, too, graduating in the fall of 2013 with a master’s degree in public relations. When he’s not in uniform he serves as the family historian. Adam was watching Thirty Seconds Over Tokyo, but it wasn’t the period’s special effects or the actual war footage of the B-25s or the recreated section of an aircraft carrier flat top built to hold four B-25 bombers that caught his attention. It wasn’t the stars, leading men like Van Johnson, Robert Mitchum and Spencer Tracey, that made him think twice. Adam asked around to find out if there was a chance that this Hallmark in the film was a part of his family. Though no one seemed to know much about the pilot, there was a connection. The Hallmark mentioned in an otherwise throwaway line in the movie was Dean Hallmark. He was the pilot of The Green Hornet, the sixth plane off the aircraft carrier in Doolittle’s daring attack. That revelation started Adam on a years-long journey of discovery about his fourth-cousin. Dean had never married and never had any children. He left behind only his parents and a sister. And while his war years are perhaps the best understood there is much of Dean Hallmark that remains lost to time. Adam’s search continues to learn more about the boy of Texas, the Auburn man, and the young pilot who would be called off to war. Dean Hallmark grew up the son of a cattle farmer in Texas, in a time when if the livestock wasn’t prospering the family might whither away. That may be why the west Texas native became a boy of east Texas. He played football in high school, appearing unnaturally large next to his teammates. He towered over others at six-feet tall. He could push around opponents with his ranch-hardened 200 pounds of muscle. With Dean playing on the line his team almost won a state championship. He graduated from high school in 1932 and eventually played a season of junior college ball in Paris, Texas. Soon after he got a scholarship offer to play at Auburn. He spent one year in the Loveliest Village, majoring in education and playing for the Baby Tigers. Back then freshmen didn’t play on the varsity squad. Dean’s reasons for leaving Auburn remain unclear, though Adam has learned that about this time Dean’s father lost a leg in a farming accident. Perhaps he went home to help the family. Back in Texas he turned to aviation. It turns out a friend at Auburn — Col. Roland B. Scott ‘38 — helped Dean find that passion. One of his flight instructors in Texas was also an Auburn man, Adam said. His early aviation career would take Dean to South America where he flew petroleum workers in and out of hard-to-reach locales. During that time Germany invaded Poland in 1939. 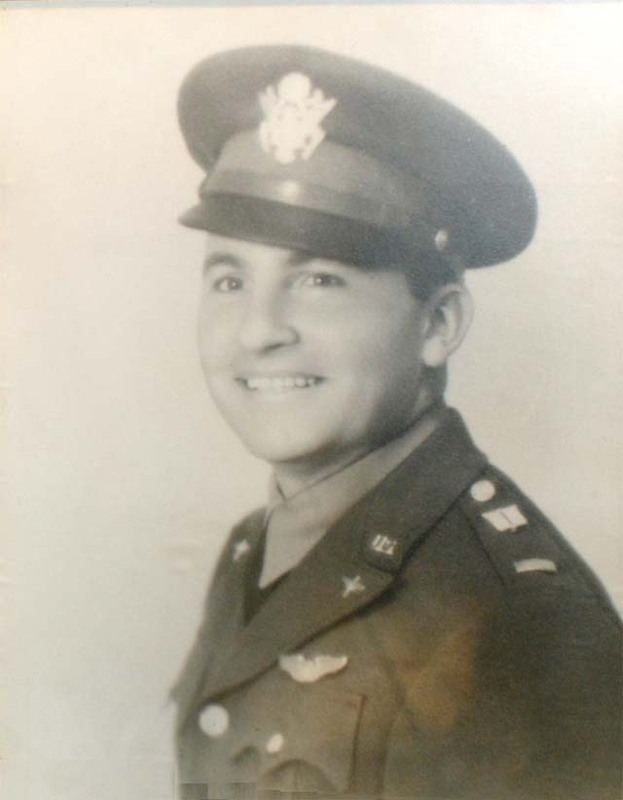 Dean joined the Army Air Corps in November 1940, before the United States was drawn formally into the war. He would become one of the first men to fly the North American B-25B Mitchell medium bomber, earning the attention of Col. Jimmy Doolittle. Aviation buffs know that Doolittle was a folk hero already, having been the first to fly across country from Florida to California. He would become a war hero for leading Hallmark and 78 other brave young men in the aerial raid of Japan in April of 1942. This was the first offensive strike at the Japanese mainland by the United States. The goal was to shake the Japanese faith in their leadership. At home, the aim was to boost morale after the devastating surprise of Pearl Harbor and bad outcomes elsewhere in the Pacific. The raid wasn’t the largest military success, but served notice that things were shifting in the Pacific. The Raiders’ launch was actually the first time a B-25 had ever used a carrier deck. Dean watched five planes lift off. This had been done exactly five times. All of their practice runs were on land. When Dean Hallmark pulled back on the controls of his bomber he was 28 years old. Dean Hallmark, photo via Maj. Adam Hallmark. A VFW hall in Greenville, Texas, is named after Dean Hallmark. A bond drive was named after him in Texas during the war. His service earned Dean Hallmark, the pilot, several awards of distinction. Dean Hallmark, the man, has proved elusive. “No one in the family had a clue,” Adam said. From those memories, the few clippings Adam has rescued from dusty library collections and the last remaining family source — a niece and nephew Dean never met — the story of Dean Hallmark, the man, is starting to come together. Picture the handsome young man with time to kill with buddies at a place called Top of the Mark. It was, and is, a bar in San Francisco, popular with soldiers for its commanding views from the highest point of downtown San Francisco. As Dean’s friends told the story they were throwing dollar bills from the balcony to the street below. After a while one dollar landed on the ledge, but the greenback was clearly destined for the ground. Dean talked his friends into holding him by the legs so he could grab that dollar and throw it on down to the street. The Raiders could recall another time in Los Angeles, where Dean enjoyed down time in a revolving bar. A man walked up to Dean as the flyboys walked into the joint and tried to start something of a confrontation. Dean sat down in the slow-moving rotating bar. With each turn of the rotating bar Dean would turn away from the view, gather up his six-foot frame in that impressive uniform, walk over and smack the guy in the head. This happened four or five times. The other man finally got the message, got up, said nothing, and left. Lt. Dean Hallmark, front left. Photo via doolittleraider.com. Those “kids” would soon play their small part in reshaping the world. It was a choppy day at sea and the deck was wet when Dean flew to Tokyo with the rest of the Raiders, dropped his bombs, made a second pass to drop more bombs, before finally making his way to China. He ran out of fuel though, a by-product of being forced to launch early, and had to put his plane into the sea just off the coast. Dean was catapulted through the windshield in the crash, the pilot’s seat still strapped to his body. He was hurt, but he and his fellow officers survived. The two enlisted crewmembers on board drowned. Once ashore the officers evaded the Japanese for eight days before being captured. They were tortured and malnourished. Dean’s navigator, Capt. C. Jay Nielsen, grimly wrote of his time as a POW at war’s end. Nielsen would also tell of having bamboo shoved under their fingernails. Their captors would light the bamboo on fire, demanding to know how they’d gotten to occupied China. Another captive would later write of being water boarded shortly after their capture. They were about to be executed, Nielsen said, but the Japanese soldiers’ orders suddenly changed. That meant more torture. Nothing was translated for the eight Raiders. Adam has learned through his research that the soldiers weren’t given any defense and were forced to sign confessions of war crimes that were written only in Japanese. Even after the trial was over they didn’t know they were going to be executed. All eight were sentenced to death. Five of those sentences, including Nielsen’s, were commuted. In the spring of 1943 President Roosevelt announced the bitter word that some Raiders had been executed, but there were no details for worried families. 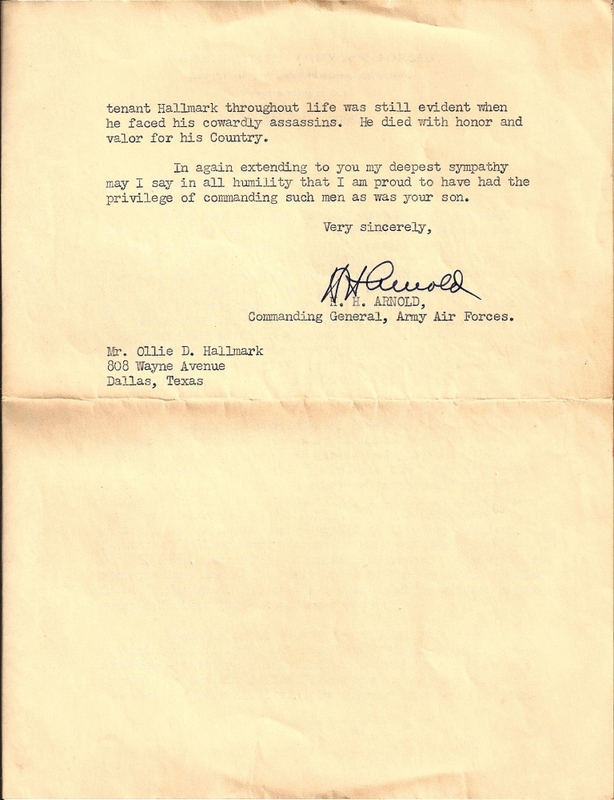 Hallmark and two others from the other bomber — 1st Lt. William Farrow and Sgt. Harold Spatz were executed by firing squad on October 15, 1942. It was, as one of the captives described it, a gray, foggy day. Dean’s family wouldn’t learn about his execution until after the war. “His parents both died broken people,” Adam said. Indeed, part of Dean’s father’s obituary a decade later was devoted to the pilot. His sister, even in her later years, was an “emotional train wreck” if anyone brought up Dean. The three letters are a part of the mystery. There are emotional expressions that suggest that the torture and solitary confinement was either impactful — the first-hand depictions immediately after the war are horrendous — or that perhaps Dean was writing under duress. But Adam points out that the Doolittle Raid was a volunteer mission. Despite such inconsistencies there are what Adam considers an element of truth to the letters. He wrote of the southern meals he missed and his girlfriend back home. After the war details of Dean’s death were finally pieced together. The three men condemned to die were taken outdoors, tied to small crosses, forced to kneel, and shot near a race track. Their bodies were cremated and buried. It has been suggested by Japanese scholars that those deaths were meant to absolve the Japanese military of some of the raid’s embarrassment. Capt. Nielsen, who wrote of his experience for the wire services, was the only member of Dean’s crew to survive the war. The Green Hornet endured the highest casualty rate of the mission. Of the 80 Raiders, 73 survived the mission. Dean is remembered as one of the finest pilots on the mission, but, as one survivor wrote, luck didn’t break his way. In 1946 four Japanese officers were sentenced to hard labor for their role in the executions. American investigators ultimately found the remains of Dean and his fellow Raiders. Today Hallmark’s ashes are at Arlington National Cemetery, where he was interred in 1949. There was an article about the Raider written in The Auburn Alumnus by his old friend Col. Roland Scott, who also named a study carrel in the RBD Library in honor of Dean. There’s also a plaque in the Letterman’s Lounge inside Jordan-Hare Stadium bearing his name. A few years back Auburn Magazine ran a feature as well, but they are short on Dean Hallmark’s time at Auburn. That remains one of the biggest gray areas in the story. Dean Hallmark died a hero to his nation. Part of how he lived is still being discovered from the faithful searching of his fourth-cousin. He now knows he lived on Glenn Avenue while he was in Auburn. There are a few pictures Adam has recently received of the strong, handsome young man sitting on a motorcycle with friends. There is another on one of the local benches, and another outside a church. Dean knew Shug Jordan. Auburn football, circa 1935. Dean Hallmark is lined up at left end. If you know of anyone from those mid-1930s football teams, let us know in the comments below. 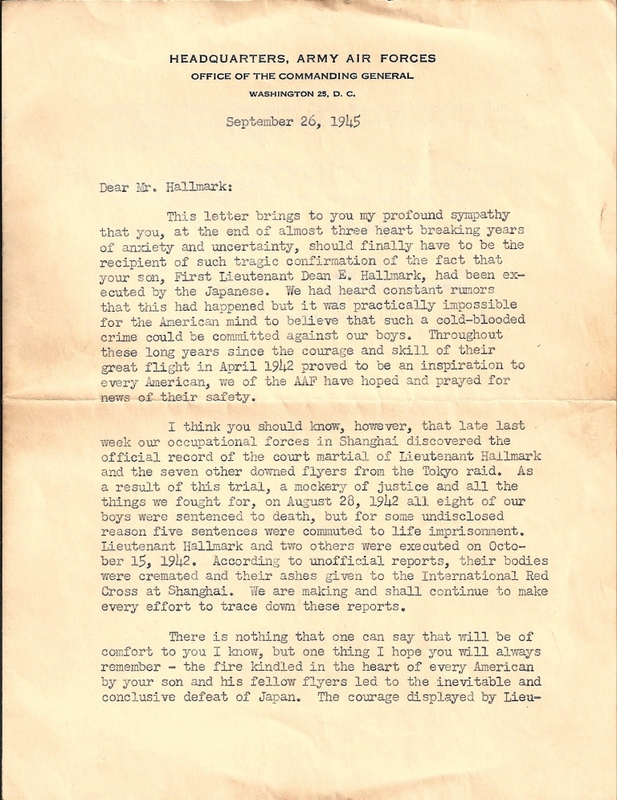 Page 1 of Gen. Arnold’s letter to Hallmark’s parents can be found here, page 2 here. Kenny graduated from Auburn at the turn of the century. He worked in newsrooms across the region and then earned a master’s degree at UAB. He met and married a Yankee, who declared her Auburn allegiance at her first home game. She’s now on the faculty at Auburn. He’s finishing his PhD at Alabama and teaches at Samford University. See him online at www.kennysmith.org and @kennysmith. If you haven’t read his emotional essay on the impact of this season, you should. A great man and an American hero. One minor quibble: Hitler invaded Poland in September of 1939. Wow. Not a small typo there. I’m blaming my fingers; my brain knows better. Thanks! A great article, and thank you! I recently met a lovely elderly lady, at my chiropractor’s office, who was the second wife, and widow, of Lt.Col. Chase Jay Nielsen, USAF (Ret.). 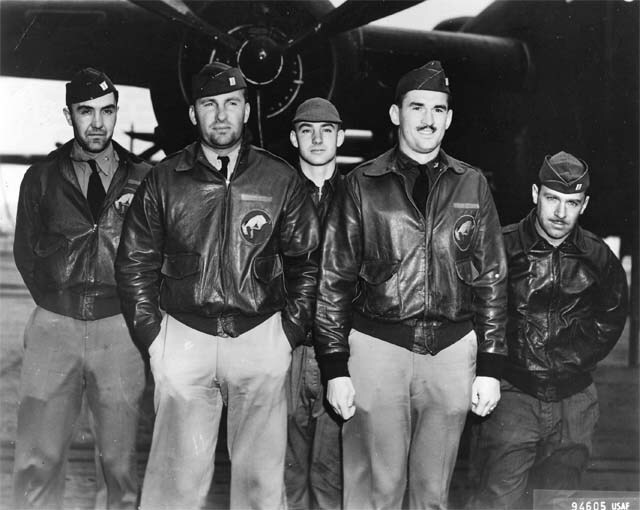 Since then, I have been studying about the other members of the Doolittle raiders who were captured by the Japanese, including Dean Hallmark, the pilot of the bomber that Col. Nielsen was the navigator on. Lt. Hallmark’s senseless execution was a tremendous loss for not just his family but the entire country; just an absolute shame! The best you can do is to keep his memory alive and allow others to learn about him now, nearly seven decades after his death. Keep up the good work, and best wishes to you!